The Tuna Melt. A classic lunch sandwich. Loved by all. Kids, adults and old ladies alike. Some guy years ago decided that the tuna salad sandwich wasn’t enough. This must have been the time when people started adding cheese to everything – BEST ERA EVER! Bread was toasted and the tuna salad received a melty slice of cheese. You can easily find a tuna melt on any deli or diner menu. Ever since i first tasted the Tuna Melt at Kitsch’n on Roscoe (2005 W. Roscoe Ave.), however, I’ve yet to find one I enjoy more. And I’m not the only one in this boat. I’ve crossed paths with other tuna melt enthusiasts in Chicago and if they weren’t already well acquainted with Kitsch’n’s, they went shortly thereafter and responded with glowing reviews. The breakdown. Start with one large, thick slice of sesame seed sourdough bread – this is going to be an open facer folks. The bread is buttered well and toasted to a perfect glistening golden brown. The tuna salad at this Roscoe Village “diner” of sorts is very well made. Quality tuna, not too much mayo, and fresh veggies result in the perfect sandwich consistency. Not too much, but plenty of salad is carefully placed atop the bread. Then comes the secret of this sandwich. A special Jalapeno Jack cheese is caramelized on their flat top which creates a virtual top layer of bread – but it’s CHEESE! And oh, how glorious this Jack is. Unlike other tuna melts, it gives the sandy a little pop. The gorgeous brown crust the flat top bestowed upon the cheese provides just the right crunch before you meet the gooey inside of the delicious creation. 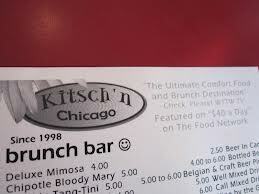 Now I’ve probably dined at Kitch’n just over a dozen times. I’ve ordered the tuna melt every single time. Really. I once ordered a second. Now it’s not to say that everything else I’ve tried off other’s plates hasn’t been (almost) equally as delicious – everything there is great. It’s just that when you have a sandwich I enjoy that much, and they happen to serve the best variation…how can I not order it – every time? Tell ’em Hungry Hungry Hinden sent ya!